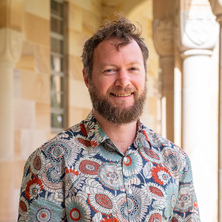 Dr Rowan Gollan was awarded his PhD in the field of Aerospace Engineering from UQ in 2009, where he was awarded the 2010 John Simmons Prize for best thesis in the School of Mechanical and Mining Engineering and The University of Queensland Dean’s Award for Outstanding Research Higher Degree Thesis. From August 2008, while his thesis was under examination, Rowan took up a position as a research scientist at the NASA Langley Research Center in the United States, working in the Hypersonic Airbreathing Propulsion Branch. Rowan returned to UQ in January 2012 in a position funded by the Defence Science & Technology Organisation (DSTO). In his role as an aerodynamic analyst, Rowan uses state-of-the-art hypersonic analysis techniques to simulate an experimental flight vehicle. Dr Gollan was awarded an Australian Research Council (ARC) Discovery Early Career Researcher Award (DECRA), which he commenced in 2014. DECRA Project summary: Next-generation launch vehicles using high-speed jet engines will make it cheaper and more reliable for humankind to engage in activities in space. This project will contribute to the technology of high-speed jet engines by developing optimised air intake systems. The research aims to advance the use of computational engineering and apply this to improve the design of air intake systems.The outcomes of this project will advance the technology of high-speed jet engines with the goal of replacing existing rocket systems. Jacobs, Peter A., Gollan, Rowan J. and Potter, Daniel F. (2012) The compressible-flow CFD project. Brisbane, QLD, Australia, The University of Queensland, School of Mechanical and Mining Engineering. Gollan, R. J., Jacobs, P. A., Karl, S. and Smith, S. C. (2004) Numerical modelling of radiating superorbital flows. ANZIAM Journal, 45 E: C248-C268. Jahn, I. H. J. , Currao, G. M. D. , Neely, A. J., Gollan, R. and Jacobs, P. (2018). Two way coupled hypersonic fluid structure interaction simulations with Eilmer. In: 21st Australasian Fluid Mechanics Conference, Adelaide, SA, Australia, (). 10-13 December 2018. Llobet, Juan R., Gollan, Rowan J. and Jahn, Ingo H. (2017). Effect of Vortex-injection Interaction on Wall Heat Transfer in a Flat Plate and Fin Corner Geometry. In: Proceedings of the 8th Asia-Pacific International Symposium on Aerospace Technology (APISAT). Asia-Pacific International Symposium on Aerospace Technology, Toyama, Japan, (). 25-27 October 2016. Hoste, Jimmy-John O.E., Fossati, Marco, Taylor, Ian J. and Gollan, Rowan J. (2017). Modeling scramjet supersonic combustion via eddy dissipation model. In: 68th International Astronautical Congress, IAC 2017: Unlocking Imagination, Fostering Innovation and Strengthening Security. 68th International Astronautical Congress: Unlocking Imagination, Fostering Innovation and Strengthening Security, IAC 2017, Adelaide, SA, Australia, (9165-9177). 25-29 September 2017. Kang, X., Gollan, R. J., Jacobs, P. A. and Veeraragavan, A . (2016). On the effect of outflow boundary truncation for numerical simulation of narrow-channel flames. In: 20th Australasian Fluid Mechanics Conference. 20th Australasian Fluid Mechanics Conference, Perth, Australia, (). 5 – 8 December 2016. Damm, K. A., Gollan, R. J. and Veeraragavan, A. (2016). On the effect of workload ordering for reacting flow simulations using GPUs. In: 20th Australasian Fluid Mechanics Conference. 20th Australasian Fluid Mechanics Conference, Perth, Australia, (). 5 – 8 December 2016. Wang, J., Gollan, R. J. and Veeraragavan, A. (2016). Verification of RANS turbulence model in Eilmer using the Method of Manufactured Solutions. In: 20th Australasian Fluid Mechanics Conference. 20th Australasian Fluid Mechanics Conference, Perth, Australia, (). 5 – 8 December 2016. Damm, K. A., Gollan, R. J. and Veeraragavan, A. (2015). Acceleration of combustion simulations using GPUs. In: Yi Yang and Nigel Smith, The Australian Combustion Symposium 2015 Proceedings. Australian Combustion Symposium, Parkville, VIC, Australia, (148-151). 7-9 December 2015. Jacobs, Peter and Gollan, Rowan (2015). Implementation of a compressible-flow simulation code in the D programming language. In: ACCM2015 2nd Australasian Conference on Computational Mechanics. Australasian Conference on Computational Mechanics, Brisbane, Australia, (). 30 November to 1 December 2015. Kang, X., Gollan, R. J., Jacobs, P. A. and Veeraragavan, A. (2015). Numerical simulation of premixed methane/air flame dynamics in narrow channels. In: Yi Yang and Nigel Smith, The Australian Combustion Symposium 2015 Proceedings. Australian Combustion Symposium, Parkville, VIC, Australia, (388-391). 7-9 December 2015. Kang, X ., Gollan, R . J., Jacobs, P . A. and Veeraragavan, A . (2014). Numerical simulations of premixed combustion in narrow channels. In: Harun Chowdhury and Firoz Alam, The Proceedings of the 19th Australasian Fluid Mechanics Conference. 19th Australasian Fluid Mechanics Conference, Melbourne, VIC, Australia, (). 8-11 December 2014. Gollan, Rowan J. and Jacobs, Peter A. (2012). On the validation of a hypersonic flow solver using measurements of shock detachment distance. In: Konstantinos Kontis, 28th International Symposium on Shock Waves Vol 1 and 2. International Symposium on Shock Waves (28th, ISSW28), Manchester, U.K., (). 17-22 July 2011. Gollan, R. J. and Jacobs, P. A. (2012). Verification of a compressible flow solver. In: P. A. Brandner, B. W. Pearce and Hawthorn, VIC, Australia, Proceedings of the 18th Australasian Fluid Mechanics Conference. 18th Australasian Fluid Mechanics Conference (AFMC), Launceston, Australia, (). 3-7 December 2012. Ventura, Carlos, Sauret, Emilie, Jacobs, Peter, Petrie-Repar, Paul, Gollan, Rowan and Van Der Laan, Paul (2010). Adaption and use of a compressible flow code for turbomachinery design. In: J. C. F. Pereira and A. Sequeira, V European Conference on Computational Fluid Dynamics ECCOMAS CFD, Lisbon, Portugal, (). 14-17 June 2010. Jacobs, P. A., Gollan, R. J., Potter, D. F., Gildfind, D. E., Eichmann, T. N., O'Flaherty, B. F. and Buttsworth, D. R. (2010). CFD Tools for Design and Simulation of Transient Flows in Hypersonic Facilities. In: VKI RTO Proceedings. AVT-186 RTO AVT/VKI Lecture Series - Aerothermodynamic design, review on ground testing and CFD, Genese, Belgium, (). 29 March-01 April 2010. Potter, D. F., Gollan, R. J., Jacobs, P. A. and Leyland, P. (2009). Numerical simulations and analysis of the 8.5 km/s CO2-N2 east shock tube condition. In: Huguette Sawaya-Lacoste and L. Ouwehand, Proceedings of the 3rd International Workshop on Radiation of High Temperature Gases in Atmospheric Entry. 3rd International Workshop on Radiation of High Temperature Gases in Atmospheric Entry, Heraklion, Greece, (). 30 September - 3 October 2008. Gollan, R. J., Johnston, I. A., O’Flaherty, B. T. and Jacobs, P. A. (2007). Development of Casbar: a Two-phase Flow Code for the Interior Ballistics Problem. In: Peter Jacobs, Tim McIntyre, Matthew Cleary, David Buttsworth, David Mee, Rose Clements, Richard Morgan and Charles Lemckert, 16th Australasian Fluid Mechanics Conference (AFMC). 16th Australasian Fluid Mechanics Conference (AFMC), Gold Coast, Queensland, Australia, (295-302). 2-7 December 2007. Brandis, A. M., Gollan, R. J., Scott, M. P., Morgan, R. G. and Jacobs, P. A. (2006). Expansion tube operating conditions for studying nonequilibrium radiation relevant to Titan Aerocapture. In: Collection of Technical Papers - AIAA/ASME/SAE/ASEE 42nd Joint Propulsion Conference. 42nd AIAA/ASME/SAE/ASEE Joint Propulsion Conference & Exhibit, California, USA, (2074-2083). 9-12 July 2006. Rowan Gollan (2008). Computational Modelling of High-Temperature Gas Effects with Application to Hypersonic Flows PhD Thesis, School of Engineering, The University of Queensland. Gollan, R. J. and Jacobs, P.A. (2003) Numerical modelling of radiating superorbital flows: with detailed governing equations St. Lucia: Div. of Mech. Eng., The Univ. of Qld. Gollan, R. J. (2003) Yet another finite-rate chemistry module for compressible flow codes St. Lucia: Div. of Mech. Eng., The Univ. of Qld. Gollan, Rowan (2001). Implementation of subsonic boundary conditions in compressible flow codes B.Sc Thesis, School of Engineering, The University of Queensland. Development of computer-based optimisation to improve hypersonic aerodynamic design. Development of software and methods to simulate gun interior ballistics in accordance with the contract condiitions and statement of requirement.